People come from all over the world to find this alleyway. 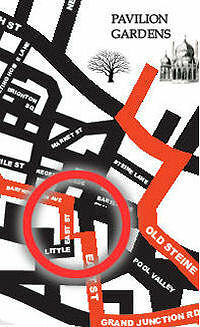 The cult film Quadrophenia was set in Brighton in the 1960s, the period of the Mods and Rockers. 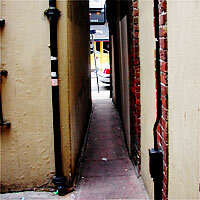 One of the major scenes takes place in this alleyway. Two lovers escape the police and fall through a doorway into a yard. The alley is a shrine to Mods. It’s very dingy, often smelly, and frequently covered in graffiti. The doorway is still there, hopefully better secured now! No-one’s tidied up this corner of Brighton. It’s like a wild area on a nature reserve. It is neither part of tourist Brighton or window-shopping Brighton. I took my Brother-in-Law for a tour and bumped into Zoe Ball and Woody. Ball Jnr was asking what they were doing down the alley and Zoe had to explain as delicately as possible what had happened there.